Please note that the castle is not open to the public. Technical details including floor plans. Scheduled Historic Building - Ref. 90007 from Historic Scotland - a .PDF document. 1. The fact that a monument is scheduled does not convey or imply any right of public access. Members of the public, and this includes archaeologists, are advised to seek permission to visit the monument from the owner and/or occupier in the normal way. 2. Many scheduled monuments extend farther, sometimes much farther, than the remains immediately visible on the surface. No work should be undertaken in the immediate vicinity of a scheduled monument without prior consultation with Historic Scotland. 1. The digital data of Scheduled Ancient Monuments in Scotland represented on PASTMAP are in most cases derived from the digitisation of scheduled areas based on the OS 1:10,000 and 1:10,560 base maps. Some Scheduled Ancient Monuments have been digitised against Ordnance Survey 1:2500 Land-line mapping and as such, the boundaries may not reflect features present on the 1:10,000 background map. 2. In ALL cases, the 'scheduled' areas depicted on this site are an interpretation of scans from paper maps derived from the original legal documents and should be seen as INDICATIVE only. 3. In all cases, it is the area described and depicted in the legal scheduling document that represents the location(s), size(s) and extent(s) of the legally protected (scheduled) area(s). 4. This resource is designed for information purposes only. The boundaries indicated, whether digitally or in hardcopy, have no legal status and none should be inferred. 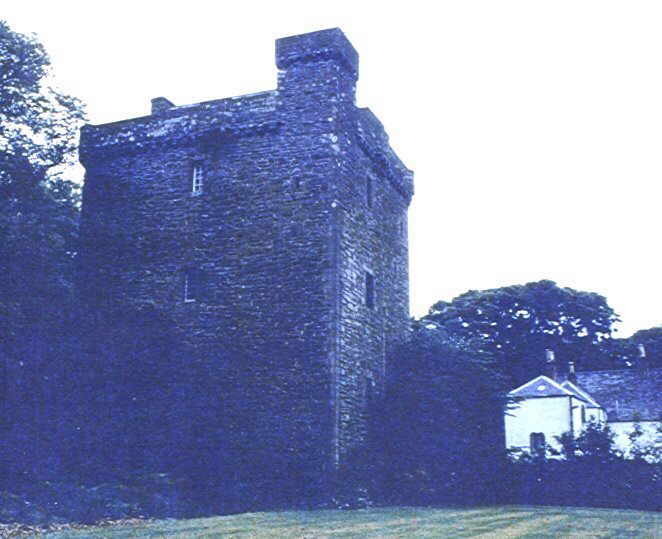 Any enquires regarding the legal location, size, extent and exclusions associated with scheduled ancient monuments should be made, preferably in writing to: Historic Scotland, Ancient Monuments Division, Longmore House, Salisbury Place, EDINBURGH, EH9 1SH. Alongside, a photograph of the castle as it looked around 1912. It is now no longer clearly visible from a public access viewpoint. During winter a vague, dark outline of the tower be seen amongst the bare trees from a gateway on the main road, or from a passing bus. You are likely to wish to look at some of the many other photographs in their collection HERE. A selection from a mid-1800's map of the grounds of the castle, showing its old name. The article below is a reprint of that first published in the DUNDEE YEAR BOOK - FACTS & FIGURES FOR 1912. In booklet form, it was reproduced by kind permission of D. C. Thomson & Co. Ltd., Publishers, Courier Buildings, Dundee, Scotland, successors to John Leng & Co. Ltd., the publishers of the 1912 book. 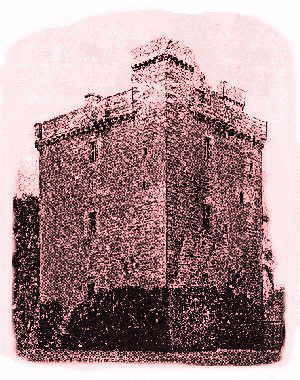 "On rising ground, set amid trees of great age, stands, near the village of Monikie, a splendid specimen of the grim Scottish tower. 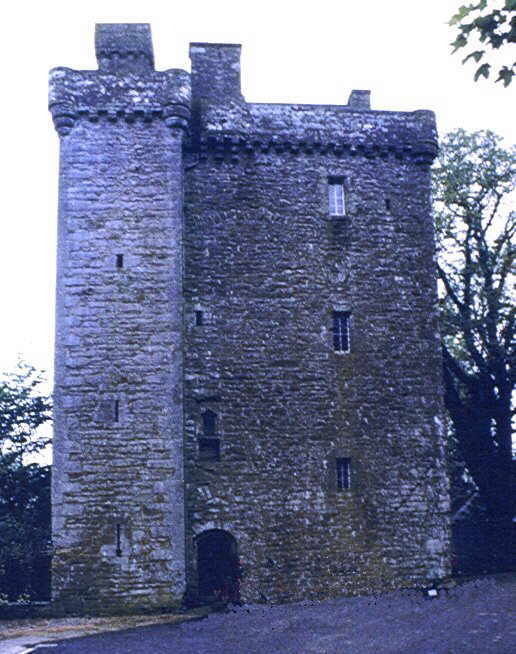 Strongly built of hewn stone, square, its four storey surrounded with flag turret and cape house, Affleck Castle wears well its burden of five centuries. The Castle Hall, with stone vaulted roof, seems to have suffered comparatively little for the years since it echoed the tramp of mail-clad knight, or rang maybe with the wassail of the Lichtsome Lindsay. The third storey was the important section as a residence, and there the imagination seeks play as, on the main apartment, one enters the tiny chapel, or oratory, with its ambry, its holy water receptacle, and its piscina, constructed in the thickness of the wall itself, eloquent testimony to the resisting power of the massive masonry. The date of erection can only be conjectured, but that it possessed the grated iron door has been fairly well established, so that in the fifteenth century the owner of Affleck, or Auchinleck, had probably obtained from James the First or James the Second [of Scotland] the customary but necessary Royal sanction to "fortifie his house and to strengthen it with ane irne yhett." For it has run three days wi' bluid." The Lochty separates the parish of Barry from the parish adjoining, and by its banks, according to the story of Hector Boece, Dane and Scot, in the year of grace 1012, struggled desperately for mastery. The Danes, smarting under a severe reverse at Mortlach at the hands of Malcolm, had assembled a mighty host in Denmark, and led by their most trusted commander, Camus sailed for Scotia. News of landing at Redhead, found Malcolm in camp at Dundee, and speedily he marched to meet the Dane. At Lochty's banks they met, and when the sun was low that day in the western sky, Malcolm was master on the stricken field, and Camus himself in flight, leaving, however, behind him in killed and wounded "twenty thousand horse and men". The victorious Scots followed hard after Camus, and overtook him near Monikie, but a mile or two from the battlefield. Again a desperate stand, with a like dire result for the Dane, and Camus himself sank to rise no more. And so here, tradition avers, they raised the cross to remember a great but unfortunate warrior. In the struggle that followed the death of the victor at Bannockburn, one of the important engagements was fought in this neighbourhood, and was styled the Battle of Panmure. A later Baliol had attempted again to play the role of puppet king to the English monarch, and was at first successful. Gathering the companions of Bruce and Wallace, what was left of them, Sir Andrew Moray, the Guardian, took the field, and gave battle to the usurper's army. The result was the routing of the English force, and the turning again of the tide of Scotia's fortunes. 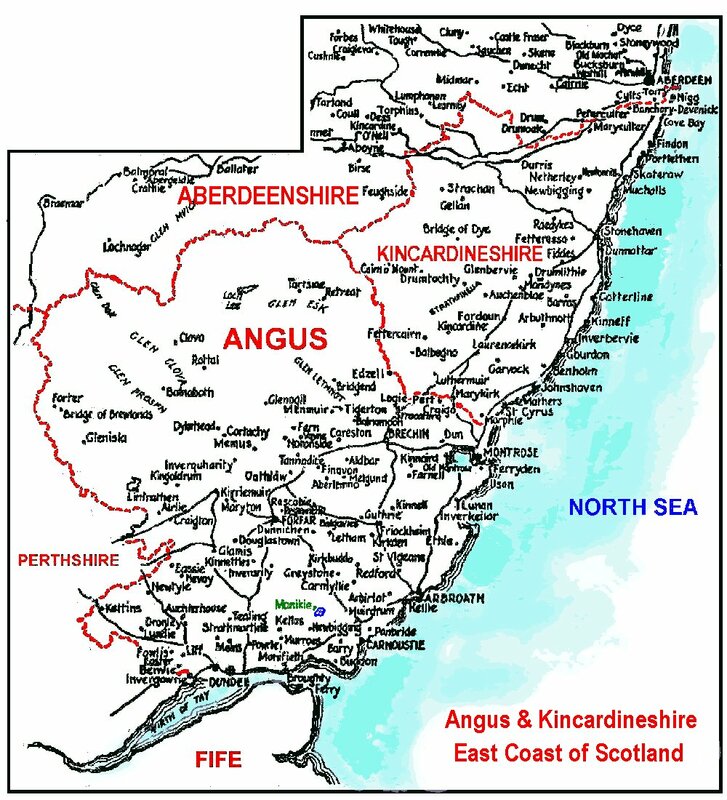 For long the Lindsays were the real Kings of Forfarshire, holding vast territories in Angus and Mearns. 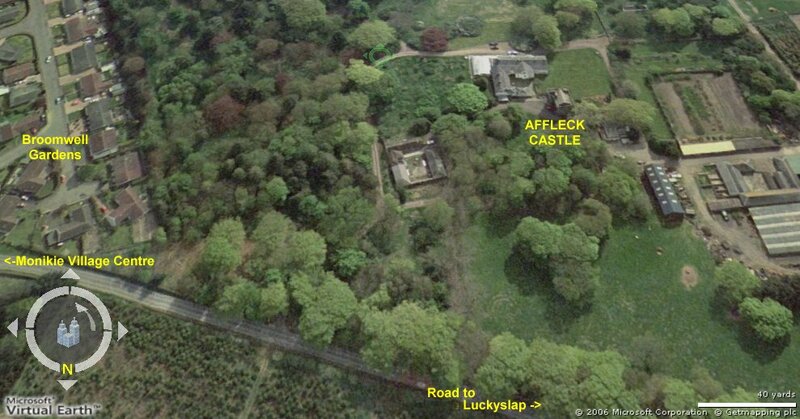 Affleck Castle was then practically an outpost of theirs, and must have been witness of many a stirring scene. When the English held Broughty Castle they built a smaller fort on Forthill, partly to strengthen their hold on Broughty, but more to enable them to advance into the heart of Forfarshire. 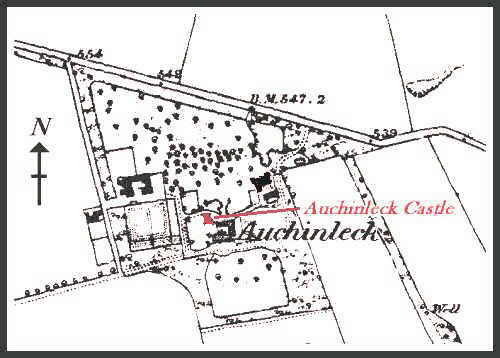 There were forays then, minor fights and assaults, and what is less unlikely than, that Affleck Castle, but five miles distant, should be free from the attention of the Sassenach, or that Auchinleck should fail to join in the efforts, ultimately successful, to drive the English out of Broughty. 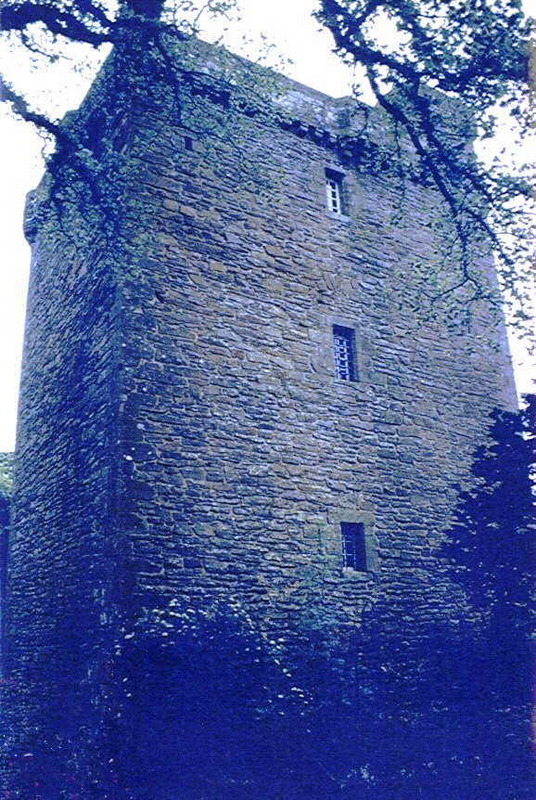 It is possible that prior to the fifteenth century there was a Castle of Aghelek, as the name first appears, occupying the site of the present tower, for among the notables in the county of Forfar who in the year 1296 bent the knee to the Hammer of the Scots, Edward the First, was one Mathew de Napier, styled I "de Aghelek". A magnate without a castle was not probable. 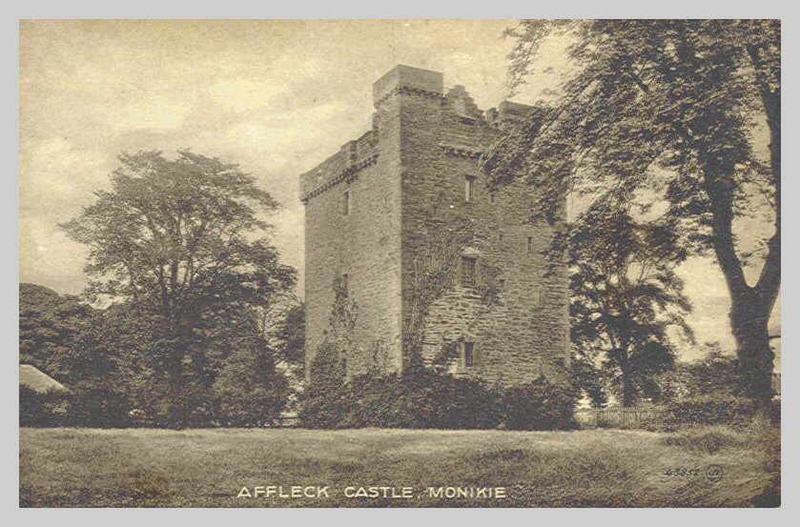 A few years later the proprietor of Aghelek or Affleck adopted the territorial name for it is on the record that "John de Aghelek" did homage to Edward of England for his lands in the county of Forfar. The name of "Aghelek" seems to point to Gaelic origin, and "a field of stones" would be a very appropriate title, since the bed of rock on which the land lies, as well as the stony nature of the soil, might readily suggest it. For James's smile the Tiger Earl cries". - the proprietors of Affleck of that day - Reids they were - yielded to the charm of the Stuart Pretender, and after Culloden had probably the price of rebellion to pay. Some years prior to the crushing of Prince Charlie, Thomas Reid had acquired the property from Gilbert Auchinleck, but the fact that a stone built into the stable wall bears the inscription "T.R.- 1748" seems to point to the Reids as still proprietors at that date. In the town of Dundee the Lindsays lived in splendour, and there too, in the then aristocratic Seagate, the Auchinlecks had their town house. The Records of the City of Dundee, preserved in the Town House, contain numerous references to the Auchinleck family, and there one with genealogical tastes would obtain abundance of material for the composition of a "Family Book". Of our Chief of ten thousand oh, where are thou now? And the race of Clan Lindsay is bowed to the dust. The son of the Tiger Earl held Broughty Castle for a time, and was Sheriff of Angus, but these honours he had to yield to Lord Gray, as unfortunately the Lindsays espoused the losing cause at Sauchieburn. This did not conclude the Lindsay connection with Broughty Castle, however, for in 1651, when General Monk sacked Dundee, he sent 500 horse to scour the district. 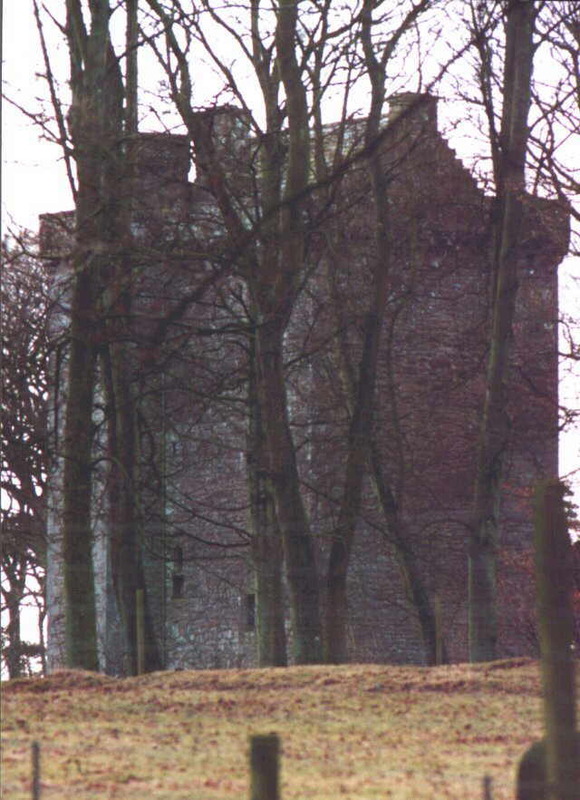 The Committee of Estates, including the Earl of Crawford, were surprised by Monk's cavalry at Alyth, captured, and were sent as prisoners to Broughty Castle. You can read more about the castle in some of the OLD BOOK EXTRACTS. Another local building called HYND CASTLE. Click here if you are a LEGO builder and would also like to see more castle photographs. The best way to find out more about the area - please use our Search Engine.